Mobile devices are gradually becoming prevalent in our daily life, enabling users in the physical world to interact with the digital world conveniently. Mobile devices increasingly offer functionality beyond the one provided by traditional resources processor, memory and applications. This includes, for example, integrated multimedia equipment, intelligent positioning systems, and different kinds of integrated or accessible sensors. For future generation grids to be truly ubiquitous we must find ways to compensate for the limitations inherent in these devices and integrate them into the grid, in order to leverage available resources and broaden the range of supplied services. On the other hand, most of mobile devices do not have the sufficient capabilities to be either direct clients or services in the grid environment. The existing middleware platforms like Globus do not fully address mobility, yet extending the potential of the Grid to a wider audience promises increase in its flexibility and productivity. This chapter looks into design architecture for mobile computing environment. Focus is given to security and its policies that will enhance the performance of grid computing in terms of secure design, architecture, accessibility, and mobility. 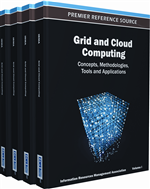 Grid computing has made rapid strides during the last few years from their first use in the scientific computing domain to enterprise grids deploying commercial applications. Grid computing permits participating entities connected via networks to dynamically share their resources. Its increasing usage and popularity in the scientific community and the prospect of seamless integration and interaction with heterogeneous devices and services makes it possible to develop further complex and dynamic applications for the grid. However, the efficient management of such a large computing platform is a considerably complicated issue and it is a constantly increasing complexity because of increasing numbers of heterogeneous devices and components being added to it (Foster, Kesselman & Tuecke, 2001). Arguably, the current level of software complexity has reached such a level of complexity that it threatens the future growth and benefits of Information Technology. A promising approach to handle this complexity is the emerging field of autonomic computing (Ganek & Corbi, 2003). It calls for the design of a system in such a way that it is aware of its constituting components and their details, it can reconfigure itself dynamically according to the change in its environment, optimize its working to achieve its goals and predict or recognize faults and problems in self-managing approach has been taken from the autonomous nervous systems of biological entities and many concerted efforts are underway for the development of this field (Horn, 2001). The effect of such an autonomous system will be the reduction in the complexity and ease in management of a large system, and what better exemplar case for its application than the grid and its middleware. Various ways have been proposed to achieve the fulfillment of this vision, from agent-based (Bonino, Bosca, & Corno, 2004) to policy-based self-management (Chan & Arnold, 2003), from autonomic elements control loops to adaptive systems, self-stabilizing systems and many more, but the motivation and ultimate goal of all is the same (Kephart & Chess, 2003). We also use guidance from the vision of autonomic computing to further build up on the MAGI middleware effort (Kalim, Jameel, Sajjad, & Lee, 2005). In what follows, we first summarize the idea of our adaptive middleware and then discuss the incorporation of autonomic behavior into its architecture. Many mobile devices are affected by battery life, storage, memory, bandwidth, processing power and security. Also, the libraries required to interact with the grid to accomplish a task are resource intensive considering the limitations of mobile devices. Conceiving a distributed system comprising of mobile devices that uses these libraries directly will not be a practical system because of the extent of the resource demands. There is a wide variety of mobile devices available, which also vary from one another in a variety of ways. On one hand, laptops offer relatively powerful CPUs and sufficient primary and secondary storage and on the other hand, devices like cell phones have scarce resources and supplementing these resources are either expensive or impossible altogether. Secondly, in mobile systems, network connections generally have limited bandwidth, high error rate and frequent disconnections. Lastly, mobile clients usually have the ability to interact with various networks, services, and security policies as they move from one place to another.